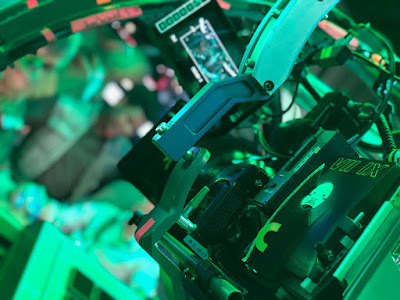 Principle photography of Star Wars Episode IX, the final installment of the sequel trilogy, began today at Pinewood Studios in London. To celebrate this, director JJ Abrams joined Twitter and tweeted out a picture of the camera from the set of the upcoming film. Abrams expressed his gratitude to The Last Jedi director Rian Johnson and Star Wars creator George Lucas for laying the groundwork for his upcoming film, as well as his sadness to be making the film without Princess Leia actress Carrie Fisher (who passed away in late 2016). It's tough to make out much in the picture Abrams posted, but it does appear to be of several characters in the cockpit of the Millennium Falcon. You can definitely see Chewbacca (Joonas Suatamo) in there, and he appears to be joined by John Boyega as Finn and Daisy Ridley as Rey.